I really must have missed something somewhere. I keep hearing “Liverpool have no RB” and “Liverpool’s defence isn’t as stable as earlier in the season”. The two are clearly directly related. But, and here’s where I really get confused, Liverpool did have a backup RB. Nathaniel Clyne. And Klopp shipped him out. On loan to a midtable club. He played last night against Chelsea. In a match where they won 4-0. I haven’t seen this mentioned anywhere, yet I’ve been screaming it to anyone that will listen for about a month. What exactly has the 27 year old, former (only because of a back injury) England international, specialist RB done to not even be classed as a decent backup when we the club has no other experienced RBs? If memory serves me correctly, he was shipped out *after* TAA got injured, it doesn’t even allow for hindsight to be used as an excuse. Hell, he was shipped out while Gomez and Matip were injured. While I think TAA is great I will be awesome, I believe Clyne is currently the better RB and never got why he wasn’t automatically brought back in when he recovered. I mean, he has to be better than Milner, Henderson or whoever is going to play there next week? Surely? And yet, Moreno is still on the books as our backup LB. I cannot help but feel this bizarre situation will lead to City winning the title. It seems like a colossal misjudgement/mismanegement and one that I’ve not seen any reasoning or justification for. That said, I can perfectly understand why Clyne would leave the club: basically for all of the above reasons. Looking for a tiny sliver of silver lining after last night’s celebration of slushy mediocrity – all the Liverpool fans getting giddy and posting photos of their Rafatollah duvet covers might just pipe down now and regain a little perspective – Klopp to his credit (limited, see below) has been managing expectations that it will go the final day all season, and it will, if we are lucky. Our performances are too inconsistent to pull away despite Citeh’s similar fallibility, and with United, (Everton), Spurs and Chelsea left to play we will definitely be dropping more points. Klopp however does have a tendency to blame literally anything and everything rather than acknowledge any failings in himself or his team – this hubris can make it impossible to address persistent problems (if you don’t acknowledge there is a problem you can’t fix it) which may lead to unresolvable issues further down the line. Last night it was the snow, Harry Maguire not being sent off and not getting the penalty in the second half. Blaming snow just makes you look soft – it’s the same for both teams (unless you only shift the snow in the half you are attacking in the second half, which Liverpool did). Maguire was miles from goal when making the foul, and the penalty, while definitely a penalty, was in the ‘seen them missed’ category. 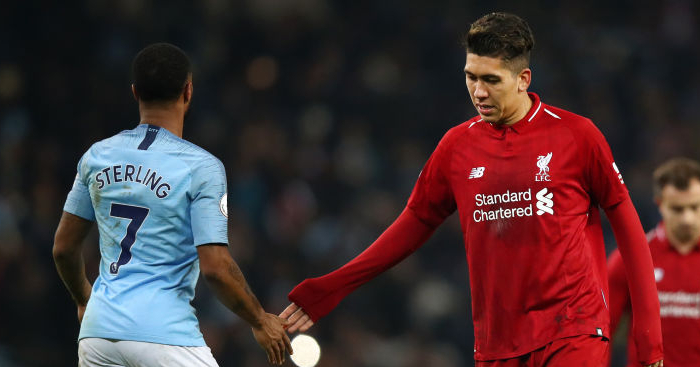 In short, please stop whining – you should be more concerned that Liverpool players didn’t seem to have the stomach for a scrap in the snow – doesn’t bode well for when things get really squeaky towards the end of the season. Liverpool have thrown the Title away from better positions than where we are now – this is not yet a team that has learnt how to win, and we need to be focussing more on improving our own performances, being less selfish in attack and stronger in defence again, rather than looking for easy excuses. 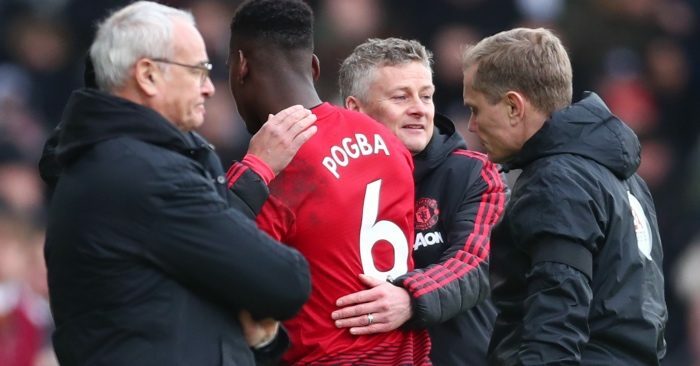 Still love the man, and the team, but will be frustrating if we throw it away again because we didn’t take responsibility for the necessary improvement soon enough to make a difference. Another game, another chance squandered. You would think that after overseeing the pathetic surrending of the chance of silverwear yet again in both the League and FA Cups that Jurgen Klopp would finally stand up and be counted, but instead he just shied away as usual. As long as he’s getting paid he’s happy. Tonights performance was genuinely pathetic, much like Klopp himself. Blaming a bit of snow on the pitch ffs. Its interesting how quickly this “man of the people” is to jump on the £25k a year groundsmen rather than himself or his fellow millionaire players isnt it? By his logic does he also credit the groundsmen when Liverpool win? To watch Man City just 24 hours earlier start quickly, score, and then fall into the trap of playing pedestrian football, and then not have the ability to stop your own players doing it, speaks volumes about his man management. The team looked nervous, but dont blame the players. 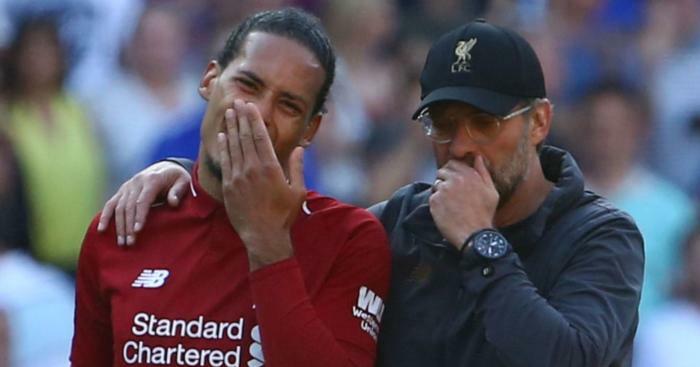 Ask yourself why Klopp made the inexplicable decision to give an interview to the BBC this week in which he spoke about how nervous and unenjoyable the title race is for him. Why not just get the squad together and tell them you have no faith in them Jurgen? It’d be quicker. But I guess theres no money in that. Hopefully whatever fee the BBC gave him was worth derailing his clubs title challenge for. The simple fact is, Liverpool play like a team who’s manager has created a culture where players dont know whether they’ll be playing from one week to the next, regardless of whether they are MOTM or the worst player on the pitch. This breeds both insecurity and lack of hunger. There’s no game plan, no continuity and no ideas. 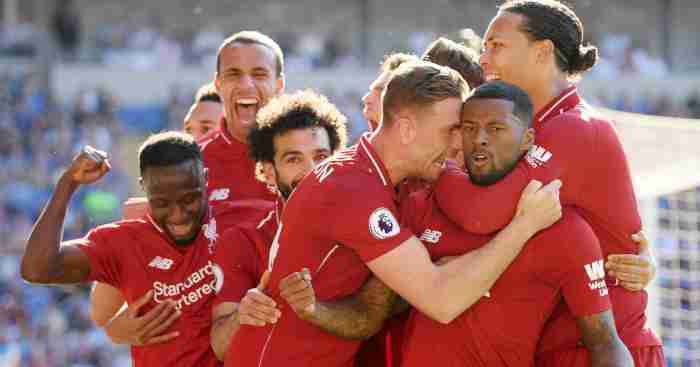 Klopp has lurched from game to game, from line-up to line-up, scraping results with deflected efforts, bizarre opposition errors, last minute goals and dodgy officiating. He’s lucky that players like Mane and Van Dijk have stepped up and shown some leadership where he has been lacking. Make no mistake, Liverpool are where they are now in spite of Klopp, not because of him. It was interesting to see the Alisson interview where he basically said it was Klopps sales pitch that convinced him to join. That is Klopp all over; he’s a used car salesman in charge of a football club. Think back to his very first press conference; the media were utterly enamoured with him. Nobody doubts his ability to talk a good game. But as with all salesmen, his ultimate aim is to make money, often at the expense of others who are gullible enough to fall for it. In this case, it’s the fans. 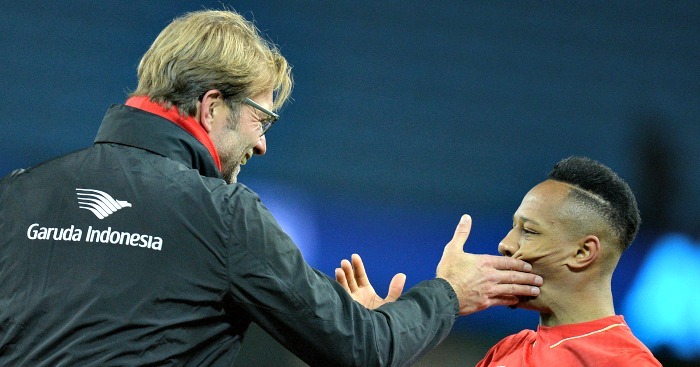 Klopp has the cynical streak required to milk it for all its worth. I mean, he wore a Beatles t-shirt for goodness sake! Its so painfully obvious it’s laughable. Put him in charge at City and it would be an Oasis t-shirt. Of course, not all fans fall for it. I’m sure Johnny Armchair will be reading this and chucking his Sky remote at the tv in anger, but some of the proper fans are starting to understand that Klopp isnt all hes cracked up to be. Thats why the fans are so nervous at Anfield. The team isn’t that great and the manager is worse. They know. One of the most damning indictments of Klopps reign is that the longer he is in charge, the less exciting his team becomes. He won plenty of plaudits for his exciting, attacking football when he first joined….but its becoming clear that this was nothing more than a continuation of the way Liverpool played under Brendan Rodgers. Klopp had nothing to do with it. After all, he’s the one who says it takes time to get used to his methods. This is now Klopps team, and it is boring, slow and predictable. And lets not forget, for all Rodgers’ failings, when he took Liverpool on a title run-in, they were starting games like a train and blowing teams away. The team were loving the challenge and that stemmed from the manager. Its becoming obvious that Klopp cant hold a candle to Rodgers in regards to his man management or motivational ability (or attacking football), and that is damning given how limted a manager Rodgers actually is. Looking at Liverpools next few fixtures I’d argue that they may very well fail to win any games in February if Klopp remains in charge. The CL game against Bayern that Van Dijk is suspended for will be an absolute disaster, mark my words. If Klopp was just honest with himself he would realise he isn’t up to the job and walk away….but then, how many car salesmen do you know who are honest? Spurs have the chance to go four points behind Liverpool at the top in December and lose to Wolves. Man City get a chance to close the gap to 1 point but contrive to lose away to the team in, what? 17th before the gameweek started? Then Liverpool, with a chance to make it more likely than not that they’d win the title, drop points at home to Leicester. Spurs, after two morale-sapping defeats predominantly due to being shorn of four of their most important players come from behind in the 80th minute to take three points. Still minus two of their most important players. The equivalent of Liverpool losing Salah and Mane, or City losing Aguero and Sterling. Two points below City. One fewer win than Liverpool. No home stadium. No signings in over 12 months ffs. And still we find ourselves comfortably in the top three. By drawing in the way they did, Liverpool extended their lead at the top of the table. That’s a good thing, therefore “winner”. By drawing in the way they did, in a game where they clearly had the quality to win, United lost the chance to go even on points with Chelsea and Arsenal in the race for fourth. That’s a bad thing, therefore “loser”. 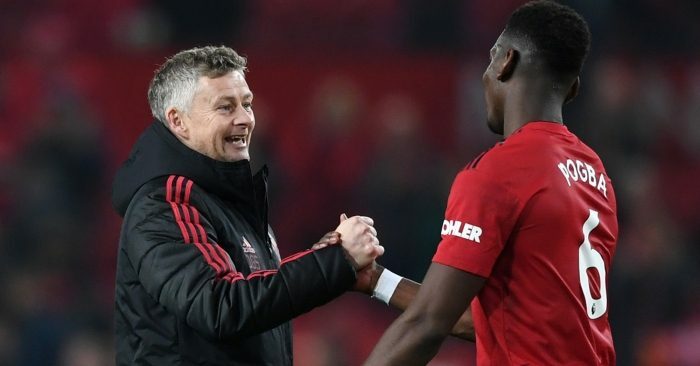 Liverpool have earned their right to draw yesterday evening, United got themselves into a position where every point lost at this stage could be the one that means Thursday night football next season. Don’t get me wrong though, given the state we were in when Ed took Jose round the back of the barn and put him out of his misery, I’m thrilled with our current position; the fact that qualification for the Champion’s League is still in United’s own hands is remarkable (and reflects badly on Arsenal and Chelsea – but no more than United’s early season form wasn’t covering them in glory). But still, in context, this week’s result was a little disappointing. Assuming Spurs do not buy anyone this afternoon, in the last three transfer windows Pochettino will only have bought Lucas Moura. Spurs are third in the table, 2 points behind free spending Man City and 7 points behind a some what free spending Liverpool. At the moment his squad is crippled with injuries and he has also many players who are grossly underpaid by modern standards. Yet he still manages to get them to buy into the team mentality and motivate them to play until the last minute and win matches. 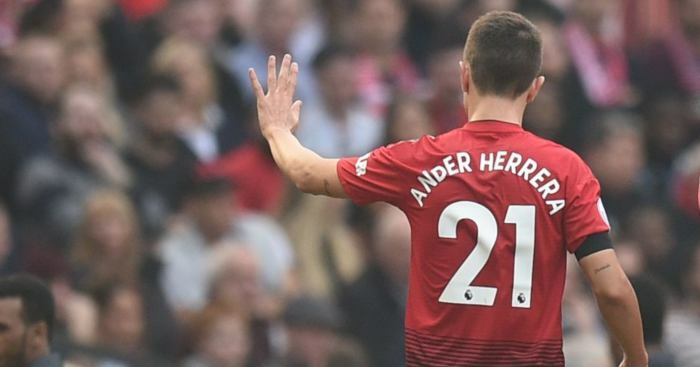 I suppose he can be beaten with the “but he hasn’t won a trophy” stick but still, surely the guy deserves some appreciation after the criticism he has been given in the last week. This is a subject I have thought about a number of times but have never felt the need or urge to write in. However after seeing one too many bottling memes on social media, a question to all – why is Manchester United’s 2011/2012 failure not regarded as an abject failure? In my eyes it is an even larger abomination. This was a team of proven winners with Ferguson at the helm, unlike Rodgers merry bunch or Poch’s 2016 vintage, and somehow contrived to lose a 8 point lead in April to finish behind their rivals. Going into game week 35 they were 5 points ahead of City and 4 – 2 up against Everton with 8 minutes left to play! If that is not an even bigger bottle job than anything Liverpool or Spurs have done, I don’t know what is. Where are the memes for this? So Salah went down theatrically after definite contact on his leg in the Palace game – Shearer says he should be ashamed of himself. Lingard goes down after a touch on his shoulder – Shearer (and Jenas) say definite penalty. In my view both men could have stayed on their feet, but a touch on the shoulder does not make your legs fold, so probably the Lingard incident is worse. Lingard however , dived more convincingly when seen “live”. Is this the clincher? The problem is that the same experienced (!) pundit saw such a difference between the two incidents even after examining them in detail. What hope, therefore , could we possibly have should VAR be extended to EPL games? It is not simply a question of what level of contact deserves a penalty, ( see Keita v Leicester) it just seems as if no-one involved ( refs,VAR HQ, pundits, fans) has any consistency in arriving at judgments. It would be better if the threshold for a penalty was raised (i.e. you have to be thoroughly clogged to get one), because my preferred alternative ( to replace them with indirect free kicks) is unlikely to reach the FIFA conference. My other idea is to tarmac the penalty area so that tumblers will get properly injured. As a Palace fan, I found myself agreeing with Bobby’s Zaha point in this morning’s mailbox. Marriner had a stinker in parts last night, the shocking tackle on Townsend from Stephens, multiple tactical Saints fouls unpunished, a potential Tomkins penalty shout and to compound it all, the Zaha incident. The bigger gripe I have is the fact that a simple and silly clap warrants a yellow but on multiple occasions in every premier league game we see players insulting and berating the referee with no callback from the referee. A certain Merseyside captain stands out for me in this instance! Surely swearing at the referee is on the level with clapping? It’s basically just a word c***s use to describe people who aren’t c***s isn’t it?